Our latest obsession is fossil hunting. During a recent trip to Percy Quin State Park, we were initially dismayed to find the normally beautiful lake now a drained, muddy bed. We made the most of it, though, venturing out into the squishy mud, collecting a few interesting rocks along the way. Back at home, the discovery of a document by Louisiana State University opened our eyes to what we had before us–rocks filled with imprints of tiny plants and sea creatures from hundreds of millions of years ago. Now hooked, we had to find more. As it turns out, a good location for Louisiana fossil hunting is in the riverbeds of the Tunica Hills area. Unfortunately, fall is hunting season at Tunica Hills Wildlife Management Area, so we set our sites on neighboring Mississippi’s Clark Creek Nature Area. A two and half hour drive from New Orleans, Clark Creek wasn’t quite close enough to make it without stopping for a sanity break for our 2 and 4-year-old. Pushing through Baton Rouge, we skidded to a halt in St. Francisville on the 400th “are we there yet? ?” interrogation. A very knowledgeable woman at the Visitor’s Center set us up with a brochure on Clark Creek as well as information on other attractions and, most importantly, food. Looking for a quick place to pick up lunch, we ordered wraps at Cozy Corner Bistro and walked past the St. Francisville Inn to eat on the picnic tables in the adjacent park. While the kids climbed trees in the park, we glanced down at the Inn’s pebble driveway and discovered the first of the day’s fossils. In under ten minutes, we had found a half dozen river rocks bearing impressions of tiny ferns and marine animals. Giddy with excitement, we loaded back in the car and headed for Clark Creek. Google routed us along Tunica Trace to the Fort Adams Pond Road, which proved to be a bumpy ride pitted with potholes. Regardless, it was a nice jaunt into the countryside, past pastures of cows and horses and even an old Pond Store, circa 1881. Just around the corner from the Pond Store was Clark Creek Nature Preserve. We parked alongside a handful of other cars and loaded our backpack with water and snacks. The 700-acre preserve boasts 50 waterfalls, champion trees and miles of hilly, strenuous trails. We set out on the leaf-covered Waterfall Trail, admiring the scenery and listening to the birds chirping. Long rows of stairs bypassed steep slopes that turned slippery in wet weather, and much of the trail had a surprisingly sharp drop-off on one side. At the intersection with the Primitive Trail, we veered off the main trail to walk along the stream’s edge (often having to jump across to switch sides). It was here that we began taking breaks to examine rocks and had already found several interesting pieces when we heard the first waterfall. Passing beyond a leaning tree, we found ourselves on top of the waterfall, looking down to the pool below. We backtracked through the woods and emerged again on the lower end, marveling at our first sight of a waterfall since the Smokey Mountains. The pool was warm to the touch, and the kids practiced their “mountain-climbing” by jumping across boulders. Although the Waterfall Trail leads to six waterfalls, we set our goals on seeing the first two, knowing that we’d most likely be carrying kids on our way out. The second was just as stunning as the first, making us realize the trip would have been a success even without the discovery of fossils. By the time we made it back to the car, nearly three hours had passed and the sky was darkening with the incoming front. Despite being a bit sore, we were delighted with our day’s adventures through this picturesque nature preserve. Plus, we found plenty of brachiopod, crinoid and tabulate coral fossils for our coffee table’s “show and tell” bowl. This is a lovely post about Clark Creek. 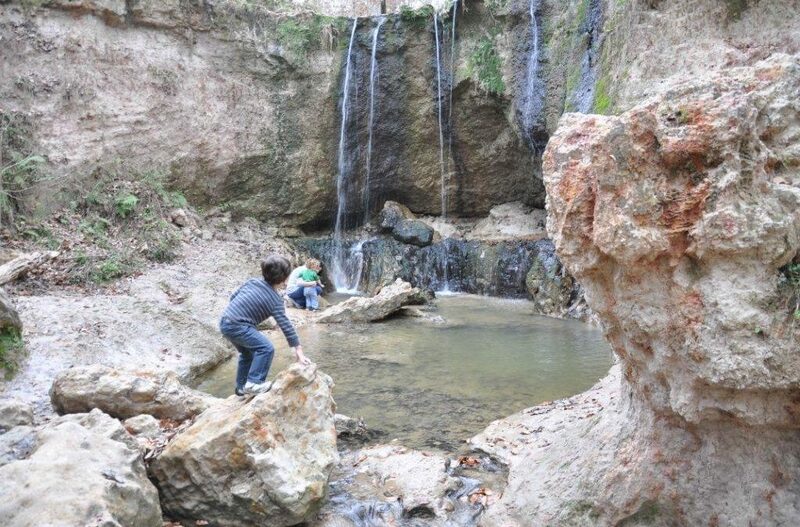 My sons enjoyed going there so much as kids, now that they are grown men, they still enjoy hiking Clark Creek. I'll bet your children do the same. Thanks, Terri. We had a great time there. My son is already asking when we are going back! Is Ft. Adams Pond Road a gravel road? Hi, Ed. No, it's a paved road, just needs a lot of work!